You are here: HomenextTransportnextTransport - shipsnextBENTAGO in Tilbury. The Fred Olsen vessel BENTAGO in Tilbury 0n 8/4/87. The container and palletised cargo carrier BENTAGO (2181 tons gross; 3950 deadweight) was built in 1983 for Fred Olsen of Norway. 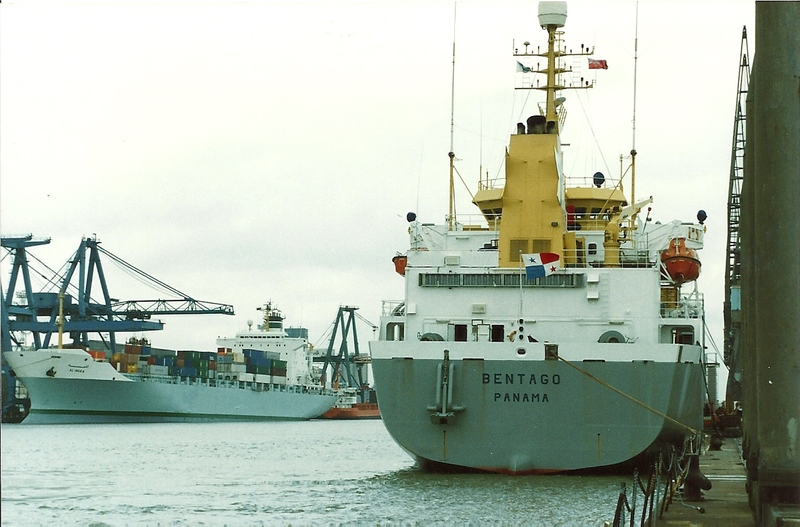 It was owned by Iberian Reefer SA, of Panama, and managed by Fred Olsen’s UK subsidiary Blandford Shipping Ltd, of London. 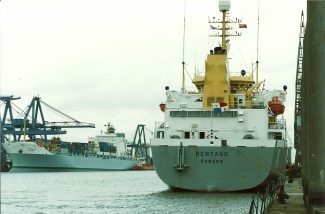 Fred Olsen had been involved in trades from the port of London for decades and BENTAGO was on the company’s seasonal regular services to and from the Mediterranean and the Atlantic islands. In Jack’s 1987 photo the vessel had a grey hull, by 1995 this was red … in 1998 the ship was sold to Green Reefers and under the name GREEN BERGEN it had a green hull. Six years later it became WILSON EXPRESS, with a blue hull. As WILSON EXPRESS, beneficially owned by Norwegian firm Paal Wilson, it is registered with Wilson Eurocarriers, managed by Wilson Shipmanagement, of Bergen, and is still in service under Barbados flag.